Bestselling author Neil Gaiman is coming back to his groundbreaking Sandman series for the first time in more than a decade. 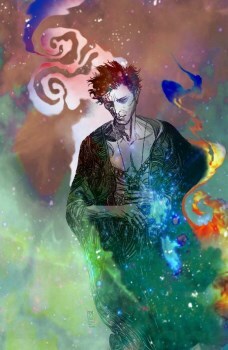 Quite possibly my favorite comic series of all time is Neil Gaiman's Sandman, a magical, often moving tale of Morpheus and his brothers and sisters of The Endless, which in my obviously-biased opinion was nothing short of brilliant and spun the sorts of stories I only wish I could tell. It ended in 1996, and Gaiman's last Sandman-related work came in 2003, with The Sandman: Endless Nights graphic novel. But he'll be returning to the series again in October for The Sandman: Overture, a brand-new tale that chronicles the life and world of Morpheus before his imprisonment at the hands of an occultist that launched the original series. The new series will be published bi-monthly on the Vertigo imprint, and will feature art by J.H. Williams III, with cover art split between Williams and original Sandman cover artist Dave McKean. "This is the one story that we never got to tell," Gaiman told The New York Times. "In Sandman number one, Morpheus is captured somehow. Later on in the series, you learn he was returning from somewhere far, far away - but we never got to the story of what he was doing and what had happened. This is our chance to tell that story, and J.H. Williams III is drawing it. It's the most beautiful thing in the world." More information about the new Sandman story will be revealed at San Diego Comic Con, where Gaiman, Willians, McKean and original Sandman artist Sam Kieth will appear as part of a panel marking Vertigo's 25th anniversary. The first issue of The Sandman: Overture hits the shelves on October 30.